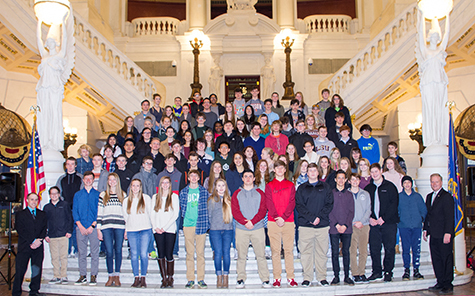 The League of Women Voters of the Lewisburg Area recently partnered with Lewisburg Area High School’s Mr. Dakota Gessner to bring the freshman class to the Capitol building on March 17. The students took a tour of the building and debated current legislation in the Majority Caucus room. What a great way to learn about our government! Recognizing that hard-working Pennsylvanians should be free to choose whether or not to join a union, I was pleased to work with several of my fellow lawmakers in reintroducing the Pennsylvania Open Workforce Initiative. Ending compulsory unionism and making Pennsylvania a right-to-work state will boost job opportunities and the overall economy. My legislation would prohibit labor organizations from collecting compulsory union dues from non-union state employees. Similar bills would apply to non-union public school and local government employees. Other measures would make all employment in the Commonwealth no longer conditional upon union membership or paying dues to a union and give public employees the freedom to opt out of their union membership at any time during their contract. The House Finance Committee has approved my bill that would provide an exemption of the state’s 6 percent sales tax on the retail purchase of gun safes and gun locks. Providing this type of exemption would remove a potential financial barrier for gun owners who are seeking methods to more safely store their firearms. It may also encourage more people to use safe storage practices. House Bill 718 now goes to the full House for consideration. PennDOT’s State Transportation Commission is currently seeking input about residents’ transportation priorities regarding safety, mobility, system preservation and accountability. The commission is working to update its Twelve Year Program, which outlines Pennsylvania’s next 12 years of transportation projects. Offer your feedback at www.TalkPATransportation.com through April 19. Applications are now available for federal grants to help rural communities better guard against the threat of fires in forested areas. Grants are available to rural areas or communities with fewer than 10,000 residents. Funding may be used for the purchase of wildfire suppression equipment, wildfire protective gear, wildfire prevention and mitigation, wildfire training, mobile or portable radios and installation of dry hydrants. The funds may also be used for conversion and maintenance of federal surplus property vehicles. The vehicles are presented to local departments exhibiting the greatest needs and those that commit to outfitting them for fire suppression. Financial assistance on any project during any fiscal year cannot exceed 50 percent of the actual expenditures, including those of local, public and private nonprofit organizations participating in the agreement. The maximum grant that will be considered is $7,500 ($15,000 total project) per fire company. The program is funded by the U.S. Department of Agriculture and administered by the state Department of Conservation and Natural Resources (DCNR). Applications are due by May 18 and must be completed online here. Two popular tax credit programs that have allowed thousands of families across Pennsylvania to choose the best education for their children would be expanded under legislation which passed the House last week. House Bill 250 would increase the amount of tax credits available under both the Educational Improvement Tax Credit (EITC) and the Opportunity Scholarship Tax Credit (OSTC) programs. Funds available for EITC would increase by $50 million to a record $175 million and funds available for the OSTC would increase by $25 million to $75 million. The EITC program provides businesses with tax credits in exchange for their voluntary contributions to organizations that fund various educational opportunities including scholarships and innovative programming. The OSTC program provides businesses with tax credits in exchange for their contributions to organizations that provide scholarships to students who live within the attendance boundary of a low-achieving public school. To make it easier for crime victims to receive the restitution owed to them, the House passed four bills designed to make sure criminals pay their legal obligations. The bills would make it easier for counties to collect restitution; authorize wage attachment; require that any bail money be applied to restitution; and require that correctional facilities make minimum deductions from the wages and personal accounts of inmates. In addition to meeting restitution, the bills also contain provisions that would require criminals to address any owed court costs, fines and other obligations. The bills now head to the state Senate.